Attractive retro triangle swimwear swimsuit tops, The halter pin up design, Monroes design look, you can adjust the halter tie at neck according to your requirement. 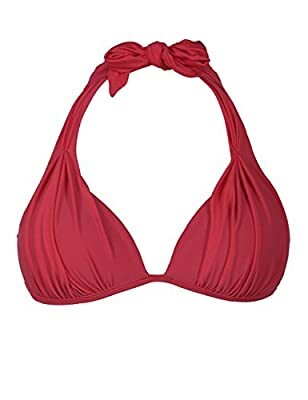 Two straps in the back for closure, adjust it according to your figure.The straps supplies the push-up function, forming a perfect bust figure. Including certify shelf molded cushioned cups, extremely light, the side versatile bone can avoid the chest heading out, offer shape and support.The moderate coverage triangle swimsuit leading garthering in front, the ruched gathering makes the swimsuit look more lovely and sophisticated, unique sewing in straps, gathering the strappy, making the striangle swimsuit bra filled with ruched, outright look flattering.Perfect to pair with a bikini bottom, take pleasure in the trip.